On 17th April 1941, Belgrade signed the capitulation of the Kingdom Yugoslavia. Macedonia, the Vardar part was still under the Serbian rule, Aegean under Greek, Pirin under Bulgarian rule, verified from the Versailles peace treaty. Yugoslavia was soon divided between Germany, Italy, Bulgaria, Hungary. Macedonia was occupied between Germany (later replaced by Bulgaria) and Albania (controlled by Italy). The biggest advantage from the occupation of Macedonia had Albania and Bulgaria, which divided again the already divided Macedonia. 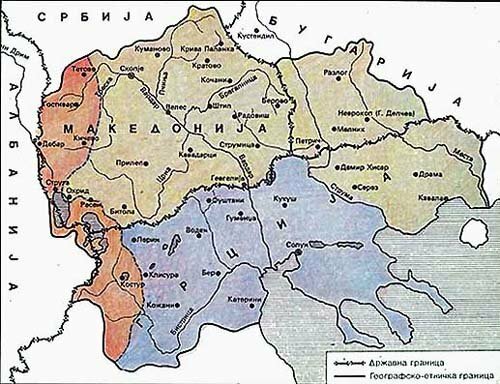 Besides the already taken by the Balkan wars (1912-1913) Pirin part of Macedonia, by the agreement from 23rd April, 1941 in Vienna, Bulgaria was awarded with the largest part of Vardar part of Macedonia, including the eastern part of the Aegean Macedonia (with Demir Hisar, Serez, Drama, Kavala). Fascist Italy as an occupator, settled in the western part of the Vardar part of Macedonia (including Tetovo, Gostivar, Debar, Kicevo, Struga and the villages in Prespa region) and in the western part of Aegean Macedonia (Kostur, Šatista). In July 1941, all of this Italian occupated areas were given to control of Albania, leaded by a pro-fascist government. The Aegean part which before the war was under Greek occupation now was under triple occupation: Albanian, Axis German and Bulgarian. Red - Albanian; Brown - Bulgarian; Blue - Germans"
The fascist Albanians in July 1941 in the regions of Tetovo, Gostivar and Kicevo spread terror on the Christian population. Around 53 villages with 40,000 peasants were depopulated, their citizens escaped in neutral countries such a Switzerland. Soon the villages were colonized by the occupator and new Albanian (Šiptar) settled here (they spread terror on the Macedonians, ethnic cleaning, what they do even today in Macedonia and Serbia). And that is how exactly Albanians approached to become a minority in Macedonia. The Macedonian language was forbidden by the Albanians and also in the Macedonian surnames -vski and -ov. The idea for Great Albania flourished during the second world war and included parts of Vardar Macedonia, Western part of Aegean Macedonia, Kosovo (Serbian province), parts of Montenegro and Epirus region. Besides the many problems at the Communist Party of Yugoslavia for Macedonia, the regional committees were forming headquarters and commissions, collecting weapons, collecting money and other. On August 2nd 1941, in Bitola, were organized demonstration of Ilinden. The diversants group of Skopje, in August committed, several successful actions at the mine Radusha, the airport Petrovec, the railway... On August 22nd 1941, they formed the Partizan Detachment of Skopje (Macedonians, Serbians, Turks, Croats and other). The National Hero Boro Petrusevski on September 9th, in a blockade killed a Bulgarian soldier. 3 days later the Communists of Prilep, created the Partizan Detachment of Prilep. On September 6th, they killed 2 Bulgarian soldiers at the tunnel at Bogomila. On October 11th 1941, in the region of Crveni Steni (Red Rocks), near Prilep, the National Liberation Partizan Detachment of Prilep, called "Goce Delcev" was formed. 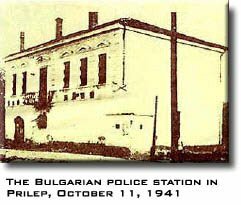 The Partizans were divided on several columns, that committed organized attack on the Bulgarian police station, the prison and the post office and other vital objects. The day of the attack, October 11th was proclaimed as "The Day of the Rebellion (Uprising of the Macedonian People". The next day, October 12th 1941, near Kumanovo, in Studena Voda (Cold Water), was formed "The Kozjak National Liberation Partizan Detachment" and in Menkova Koliba was formed the "Karadak National Liberation Detachment". The spring 1942, new Partizan Detachments were formed, Skopje Partizan Detachment (April 17th), Bitola Partizan Detachment - Pelister (April 12th), Partizan Detachment of Prilep (May 15th), and the Veles Partizan Detachment - "Pere Tošev". At the beginning of July, 1942, the provincial military headquarters was renamed in Main Headquarters of The National Liberation Partizan Detachments, lead by Mihajlo Apostolski. The summer and the autumn 4 new detachments were formed: Bitola - Prespa partizan detachment (July 6th), Kruševo Partizan Detachment - "Pitu Guli" (August 19th), Mavrovo-Gostivar Partizan Detachment (September 30th) and the Partizan Detachment of Šar Planina (November 3rd). 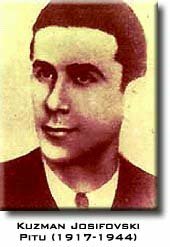 On March 19th 1943 in Tetovo, the Communist Party of Macedonia was formed by Lazar Koliševski (secretary general), Kuzman Josifovski - Pitu, Cvetko Uzunovski, Strahil Gigov, Mara Naceva and Bane Andreev. 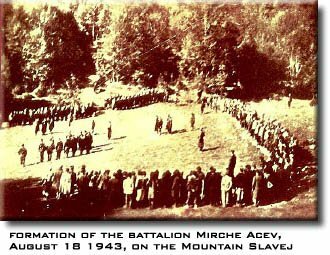 On August 18th 1943, on the Mountain Slavej, after a meeting in Prespa was formed the first bigger military unit of the National Liberation Army in Macedonia - the "Mirce Acev" battalion, from the fighters of the Damjan Gruev detachment and new, that approached at the units as a volunteers. After this the process of creation of bigger military units started of the Macedonian regular army. Fascist Italy signed it's capitulation on September 8th, 1943. The largest part of the regions occupied by Italy, were re-occupied by Nazi Germany and the Macedonian partisans imprisoned many Italian soldiers in western part of Vardar Macedonia and used their weapons and ammunition for themselves. Soon there were new battalions formed and in September 1943, there were 9 battalions and several Partizan Detachments. As more and more volunteers approached to the detachments and the battalions in the villages of Slivovo, Debarca region was formed the First Macedonian-Kosovo brigade, with 800 partizans, divided in 4 battalions and 1 artillery column. Later several other brigades were formed and even bigger military units (corpuses and divisions) of the Macedonian army. 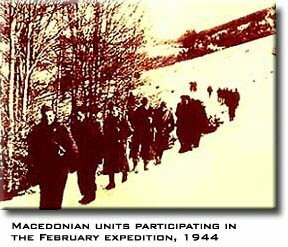 "The Movement of the February Expedition 1944 in Macedonia"
To get more volunteers for National Liberation war, the Main Headquarters of the National Liberation Army planed it's soldiers, to penetrate through the Kozuf Mountain from Aegean Macedonia, where they were settled in the winter 1943-1944. The target of this expedition was with one brigade to enter the Vardar part of Macedonia in each of 2 ways of direction, by the valley of the river Vardar to enter in central and eastern Macedonia. The expedition started on January 31st, 1944 and the members of the Macedonian-Kosovo brigade, from the Bahovo village, penetrated in Azot and Bogomila, the region of Veles. After a walking 300km and several difficult battles, with the Bulgarian well armed soldiers at Bogomila, they went back to Aegean Macedonia. On their way back they hit the Bulgarians while the crossing of the river Crna. The second Macedonian brigade, after several battles on the way Kožuf - Demir Kapija, destroyed the organs of the Bulgarian authority and closed it's schools. 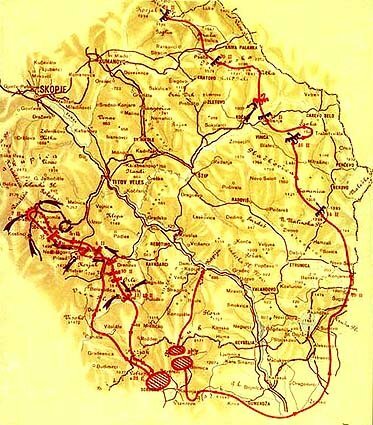 The group of battalions lead by the General Headquarters of the National Liberation Army crossed 400 km, through the mountain of Belasica, Plackovica and Osogovo, reached their target the Kozjak mountain, where they hit the Četnics of the Četnic Corpus of Vardar and other enemy forces. Just after the expedition of February, the Bulgarian army, started several offensive battles in Macedonia, in order to cut the line of the communications between Albania and Greece, that lead through Macedonia. On the other side, the general headquarters of the National Liberation Army in Macedonia planned offensive in order to liberate Macedonia. All of the Macedonian military units took part to realize this master-plan. The First Macedonian-Kosovo Brigade got the assignment to liberate the western part of Vardar Macedonia, what the brigade did successfully. The Second Macedonian brigade played battle in the region of the river Vardar (Povardarie), Prilep and Bitola and the Third in Kumanovo, Kozjak and southeastern Serbia. During this battles that lasted 2 months, the Macedonian army had losses, but bigger were those of the Bulgarian occupator. So the Spring Offensive was rated as a successful phrase of the final liberation of the Vardar part of Macedonia. During the spring offensive, many new volunteers approached at the lines of the Macedonian army. In order to the final liberation of Macedonia, the army was re-organized. And finally on September 9th, 1944, the fascist Bulgaria signed it's capitulation. With the weapons and ammunition discovered from it's 5th Division, the new soldiers were armed. The intensive operations in order of the final liberation of Macedonia were played during the entire 1944. In the autumn there were new military units formed, like new division and corpuses. At the final operations of liberation, at the lines of the Macedonian army there were 100,000 soldiers. The Macedonian army established a great cooperation with the units of Serbia and later with the units of Bulgaria, that after the fall of their fascist government, announced war on the fascism. The last military operations for liberation of Macedonia were at the end of 1944, at Tetovo and Gostivar, held by the Albanian fascists (Balists). 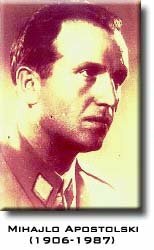 The Nazi German occupator was caused several great losses. After the liberation of the Vardar part of Macedonia, the Macedonian soldiers took part in the liberation war of Yugoslavia, at the front of Srem, and for liberation of Croatia and Slovenia. Later there were ideas, for liberation of the other parts of Macedonia, the Aegean and the Pirin one, but in because of the hard terms in that time, those plans were unsuccessfully. Just after the Second World War finally after several centuries of trying, the Macedonians got their own state, the new and modern Macedonian state was established at the Yugoslav south, covering an area of 25,713 sq km.